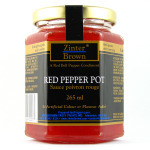 Imagine the bountiful sweetness of juicy raspberries entwined with the warm zest of plump, fresh red bell peppers. Then we mingle in sugar, water, pectin, vinegar and carefully selected spices for a raspberry pepper jelly that's a mouth-watering taste sensation. 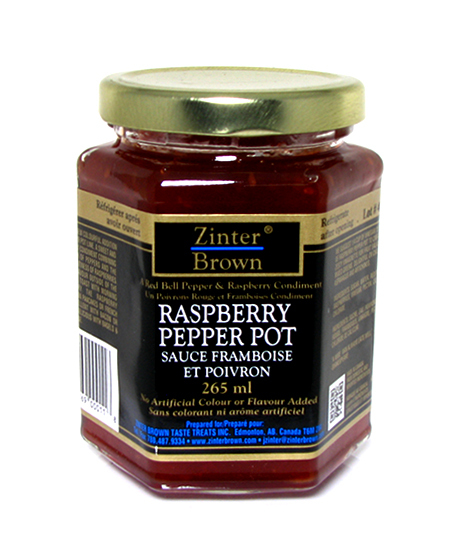 Try our raspberry pepper jelly as a glaze on chicken breasts. Serve raspberry jelly on the side with ham or pork. Unforgettable as topping for cream cheese, brie and goat cheese. Our fruity specialty jellies are uniquely delectable with creme brle. 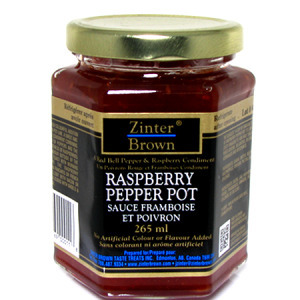 Our raspberry jelly may become your permanent red pepper jelly substitute. Buy our specialty jellies in bulk to save on shipping, or try a couple at a time. 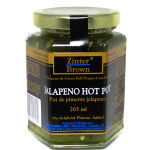 Our Zinter Brown family of gourmet taste treats make wonderful gifts for friends, associates or yourself! 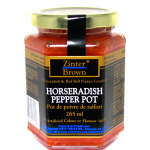 And don't forget to share favorite recipes using our raspberry pepper jelly!